SoftWashing is an effective method for removing stains caused by bacteria, fungi, algae, lichen, and moss from your roof, siding, wood fencing, and decks. It is a suitable alternative for power washing, and its low-pressure system is safe and won’t damage shingles or siding. Siding and roofing materials can become discolored over time. 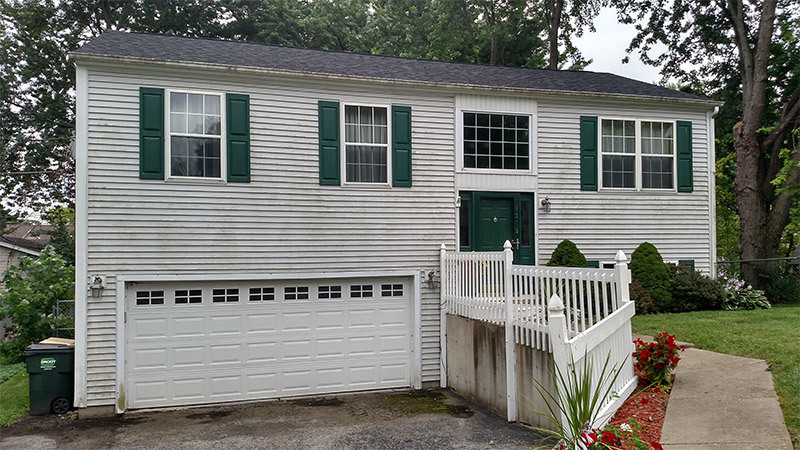 This discoloration is caused by moisture getting caught and trapped behind the siding or gathering along the building surfaces. The moisture then serves as a catalyst for bacteria and algae growth. Through the use of low pressure water and specialized cleaning solutions, your siding and gutters can look like new again. At Clearchoice Services, Inc., we use SoftWashing to gently clean your siding, roof, gutters, and more. 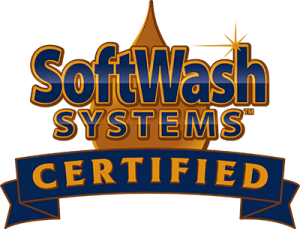 We are a SoftWash Systems Certified Company, and our trained professionals have the equipment and training to safely and effectively remove dirt, grime and algae. The specialized cleaning formula is designed to dissolve grime without the use of high pressure water. Environmentally Safe & Friendly: The SoftWash System uses less water than power washing and the cleaning solution is biodegradable and non-hazardous. Inhibits Algae Growth: The SoftWash Systems cleaning formula includes a growth inhibitor that actively works to prevent algae growth after cleaning. Safe, Low-Pressure System: SoftWashing is safe and effective for all exterior surfaces. It won’t damage siding, fences or roofs. How Often Do I Need to Clean My Home’s Exterior? If you have staining or visible bacterial, algae, or fungal growth, you should have your property cleaned right away. Over time, these problems will only get worse and can cause physical damage to your property. If your property located in a shaded or damp area, you may also consider having your home treated using softwashing, as these conditions can cause bacteria and algae to thrive. Contact us today to learn more about our SoftWash or pressure washing solutions.